What are your boating needs? Our lifts are available in 5000lb, 6000lb and 7000lb capacity allowing you to select a lift that will accommodate your watercraft. Hydraulic operation lifts provide swift and smooth travel straight up and down: which offers ease of use in high traffic areas of the lake. RGC Hydraulic Vertical Lifts combine the advantages of our Aluminum Vertical Lifts with the speed and quiet of hydraulic power. A versatile lifting range permits the same lift to be used for both shallow and deep-water applications, as well as in areas with fluctuating water levels. HVLs are available in 4000, 5000 and 7000 lb. 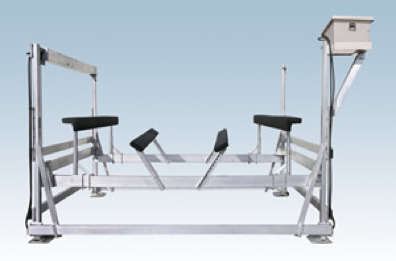 lifting capacities with various beam dimensions and lifting heights depending on the model.